Fuse Powered Inc., in partnership with Beach Cooler Games and Universal Partnerships & Licensing, have announced the release of Universal Movie Tycoon for iPad, iPhone and iPod touch. Free to download on the iTunes App Store, this builder offers a unique cinematic twist on the casual sim genre. Players take the reins of Hollywood’s most famous backlot in the world’s largest working movie studio, building Universal Pictures from the ground up, and making versions of beloved blockbusters like E.T. : The Extra-Terrestrial, The Mummy, Jurassic Park and Bridget Jones’s Diary. Universal marks its 100th anniversary in 2012, and the game release is timed with a yearlong celebration honoring the studio’s rich film history and cultural legacy. 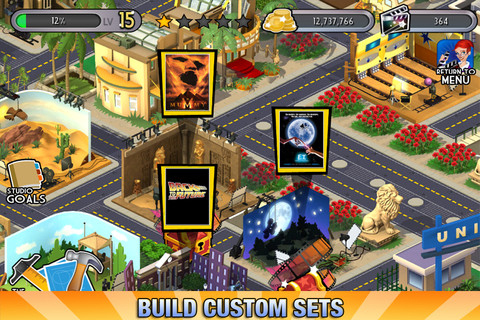 Universal Movie Tycoon invites players to build amazing sets, attract famous actors and directors, manage top-of-the-line studios, and buy new scripts to produce the most profitable movies in Hollywood. Join other cinephiles, movie moguls and pseudo celebs – check out Universal Movie Tycoon on Facebook and Twitter. This entry was posted on Friday, March 30th, 2012 at 9:11 am and is filed under Casual, Everyone, National News, New Releases, Simulations. You can follow any responses to this entry through the RSS 2.0 feed. You can leave a response, or trackback from your own site.